After a great deal of searching and product evaluation, Precision Tandems located U.S. & Taiwan based electronics manufacturing companies to supply the power unit and headsets that comprise the Tandem-Com communication system. We suggest carrying a Ziploc bag in case of a true downpour to provide protection for the entire system. Excessive moisture from a soaking rain could potentially cause damage. Should your unit inadvertently become wet, turn the unit off and let it dry out with the battery cover removed for 3 or 4 days before turning it back on. Remove the microphone cushions during this time as well. There are a couple reasons but mainly because it is an external speaker type which sits outside of the ear and there is NO contact with the sensitive tissue in or around the auditory canal . The headset remains in place via a simple loop that goes behind the head and placed over the ears, like putting on a baseball cap. Can I expand my Tandem-Com system for use on a triplet or quad! Not at this time, at least not in full duplex operation. It can be setup so that all riders hear the captain but only one can be heard talking back. How long will my two AAA alkaline batteries last? We have been amazed at how this little unit sips the current ever so slowly from the batteries. We are able to get 90+ hours out of alkaline batteries before some garbling of sound and a dimming of the LED with lower volume was noted. How does music play through the system? As far as we know, any CD player, MP3, tape player, or transistor radio will play through the system. Simply plug in the music system to the Tandem-Com 'Audio' port using the player's headphone jack. Does the Tandem-Com have a warranty? The Tandem-Com and the Ultra Headsets are guaranteed to be free from defects in materials and workmanship for a period of 90 days from the date of purchase. Broken headset wires fall into the wear and tear, use and abuse category, and are not covered by our supplier. Should you experience difficulty with your Tandem-Com, please thoroughly read the User Instructions. 2.5" x 2" x .675"
Ease of Volume adjustment by stoker when on the fly? Power inadvertently turns on draining battery? We have an RV and desire to use the unit in a remote location or need longer headset cords due to the width of our coach. Is it okay to use an extension cable with the headsets? Yes. These may be purchased from any Radio Shack in different lengths. It is also possible to make your own by purchasing wire and 3.5mm audio stereo connectors. Take the headset with you to insure you get the proper extension. Feel free to call us at 913-962-8866 to discuss any concerns. Will my I-Phone work with the Tandem-Com? Both people can hear but only one person can talk, the person plugged into the middle hole. We listen to music, answer calls and make calls; how cool! Will by Blackberry play music in the background? Yes. Music remains playing in the background while you converse. Just a quick note to say that the package arrived at the end of last week, and we have been using the Tandem-com all week. It is absolutely wonderful. It works like a dream; it means we can chat together all along the route to school in the morning as well as listening to music as we cruise along. Both my son and I couldn't be happier. Many thanks. OK, I'll opine on this. replacing. Since then we have been more careful handling the headsets and have not had any problems with them. I also wasn't ecstatic over how to carry/mount the electronics box. It does easily fit into a jersey pocket but that is not a great place for someone who perspires as I do. My solution was to mount it on a piece of flat carbon fiber I had laying about. It is approx. 3"x5" and has some poly-something fuzzy stuff used in vacuum-bagging, to act as a comfort padded layer. Other cloth materials could be used. This is worn as a mini-mini backpack, suspended by some 1/8" elastic chord (sourced at the REI camping/climbing counter) serving as a stretchable shoulder straps. It keeps the unit somewhere on the middle of my back where the stoker has easy access to plug/unplug and adjust volume easily. Just about the only complaint I have is that at speed (25-30mph on downhills) the wind noise over ears and the headset speaker still make communication a bit difficult. At our normal speed which is far below that, talking is very easy. We can even quietly comment about other nearby riders without being overheard. In short, we can communicate as easily as sitting next to one-another over coffee. Batteries last so long that I don't know how many hours or miles they last. Since we live in SoCal (where it never rains and when it does, we don't go for a ride) rainproof is not much of an issue. We have been caught out in light rains using the Tandem Com and not taken any particular steps to protect it and did not have a problem. I do have a plastic bag somewhere, that I can put the unit in. This is a bit lengthy and sorry for that but I like the unit and want to provide a true experience. We have been using Tandem-Com intercoms for several years now and they have been a great addition to our enjoyment of traveling on our tandem. Just thought I would get back to you on how happy we are with our headsets. This is an amazing improvement over yelling at each other - no more turning heads early on a Sunday morning. We started using them on the second ride out this year and even managed to lose a chain, stay upright and not pull the head sets apart. Perhaps more seasoned riders will laugh but that was a major accomplishment on a busy road to boot. Thanks so much for a great product. We love our Tandem-Com. Riding is much more relaxed as the result of the increased level of our communications. Our Tandem-Com likely saved our marriage, or at least our ability to ride our tandem together. We would end many of our rides with arguments (sometimes before getting back to our car) because we each thought the other was yelling in anger rather than to be heard. My wife couldn't hear me tell her to soft pedal to avoid hitting other riders, so I would stop pedaling and she would keep going with painful results. It was frustrating for both of us. The Tandem-Com makes biking more enjoyable than I could imagine and I have the best stoker in the world. So thanks. Just thought I'd send you a quick note to let you know the Tandem-Com works perfectly with the Blackberry. Music remains playing when you talk back and forth without being to loud to be able to hear voices. There will be 42 tandem teams at the rally we're attending that starts in about 10 days. We will certainly be recommending your product. You can add us the group of people pleased with the intercom system. We did a few hours this morning and it worked great! It made talking so much easier. The time seemed to go by quicker too. Thanks again for your exceptional customer service. We really enjoy riding without having to yell back and forth. It makes riding much more enjoyable and safe!!! We really like our recently purchased Tandem Com communication system. We have been a tandem team for 20 years, and the addition of the Tandem Com has really added even more enjoyment to our rides. Received tandem.com today and it looks like it works even on my partially deaf left ear. I think it’s going to work just great!!!! We received them and enjoyed them on a ride yesterday! After almost 500 miles of riding we are very happy with our tandem com! We wouldn't think of riding without it! Thanks for getting our Tandem-Com to us on short notice. How did we ride so long without this? It's so nice to be able to share a normal conversation while we ride, and my wife/stoker appreciates the subtle communications when in traffic or difficult situations. We really enjoy our Tandem-Com! I got the Tandem-Com at work yesterday, I will buy extra batteries for the units and wrap it up for Father's Day. I am so glad this worked out and that I met the lovely couple who raved about theirs. yelling "what?" all the time gets so tedious. that I don't think we would like to be without it. Just wanted to let you know how much we're enjoying the tandem-com headsets. Adds a whole new dimension to the ride. They were definitely worth the wait. BTW, I (we) love the Tandem Com headsets that my stoker got us for my birthday. It makes communication sooo much easier. It is well worth the added stuff we now have to take on a ride. Just used my new Tandem Com last week with my wife. What a neat deal. I can't say enough good things about the product. Really. Being able to talk in a normal tone without the usual yelling was priceless. It was the first time in the year we have owned our tandem that we could truly relax and ride. No more yelling " bump" or " car" and then wondering if my stoker has enough time to react with me. We even plugged in her ipod shuffle and listened to music together . ( I did catch her on several occasions dancing in her saddle , makes for a interesting ride )The wind noise was only evident when we had a strong cross wind and I mean strong but was a minor nuisance at the most. It was remedied somewhat by turning the earpiece down a notch. That was only with strong winds, the majority of the time the sound was perfect. 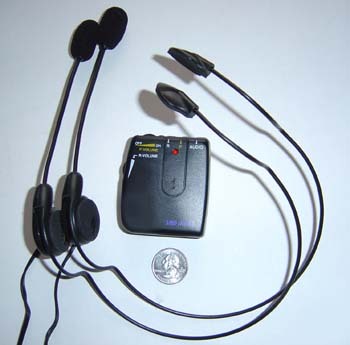 Earpieces were comfortable and the unit was unnoticeable in my back jersey pocket. The separate controls worked perfect. What a blast being able to talk and laugh during our ride. We love riding our tandem and now it is complete. Thanks and to those reading this , I'm really not being paid , I just love it when things work as promised or in this case : Better. We also have the Tandem-Com unit, and love it! As relatively new tandemists (less than a year) I find it so much better for communication than trying to yell and being frequently misunderstood, like yelling "Whoa!" (OK, we're from Texas, alright!?!) and my stoker hearing "GO!" We can speak in full sentences instead of 2 or 3 word shouts, all at a normal volume. It really adds to the enjoyment of the experience, especially riding somewhere new like a charity ride or touring... We don't find the wind noise to be intolerable, and when we're traveling at anything approaching about 30 MPH, I don't want to do a whole lot of talking anyway! We did try a cell phone headset once with the Tandem-Com when one of ours was broken, but the wind noise was so bad it was unusable, so we did without the unit until Mark Johnson at Precision Tandems (precisiontandems.com) kindly replaced our broken headset (which was already out of warranty I might add!). Once again I want to tell you how pleased we are with our Tandem-Com. We have used a Tandem-Talk for five or so years, and although we were generally satisfied, I was not happy with the earpiece. It didn't fit me well, and as a consequence, I experienced a lot of interference from wind noise. The Tandem-Com has completely eliminated that problem while providing several superior features. The light, compact unit is more comfortable in my jersey pocket, and the easy access, separate volume controls solved a problem we had almost forgotten because we just gave up on it. My hearing is pretty poor, while my wife's is fairly acute. Now e can each set the volume to a comfortable and effective level. It's just an all-around great system. And then there's your wonderful offer to credit us upon delivery of our Tandem-Talk which is enclosed. Please credit my VISA card for the $35. Thanks for the note for the credit on the trade-in program for Tandem-Com. We were able to go outside for a couple of hours yesterday (windy but 42 degrees) and it worked great. Very little (no) wind noise, - most of the wind noise was simply the air passing over our covered ears. Enclosed is one complete Tandem-Talk (only used a couple of times) - Really like the features of the Tandem-Com. [I] understand you can credit [my] charge card account for $35 on receipt of the Tandem-Talk. We just returned from a weekend ride with the Cascade Bicycle Club (The largest club in the nation). All of the tandem pairs were using your Tandem-Com wired intercoms. None were using the Tandem Talk units although one couple had replaced a Tandem Talk with your Tandem-Com wired intercom to get the improved reliability of sturdier cords and improved volume control. We first experienced the joy of free communications without the annoyance caused by even a few feet of separation and wind while riding our tandem. Being able to make small comments about interesting sightings or road conditions added a new dimension to our tandem riding experience. Amazingly, this weekend my wife and I were on our single bikes and achieved the same carefree communication by using wireless Tandem-Com units. We could effortlessly speak and hear simultaneously without button pushing or voice delays. The increased enjoyment and safety has made our Tandem-Com an essential part of our riding equipment. We've also been using a Tandem Com and love it. It makes it much easier for her to hear me. Conversations are effortless and I can concentrate on piloting. You can get more information on the Tandem Com at Precision Tandems (http://www.precisiontandems.com). (Look for intercoms.) It consists of 3 parts: two headsets, and the intercom. The headset has one earpiece and a microphone. They are very light and are no more uncomfortable, for me, than wearing glasses. (I wear both). The intercom itself is very small, about the size of a matchbook, but thicker. I clip it to my jersey pocket and Kris can adjust the volume for both of us. The volume controls are independent. We find that we talk a lot more because it is so easy -- and comfortable. This unit is a VAST improvement over Tandem Talk. As promised, an update on our trip to Le Mans and the suitability of the Tandem-Com. Well, hard as the ride down was we made it in 3 days,285 miles, the intercom was brilliant especially while we cycled into a headwind, without the unit I would not have heard instructions/complaints from the stoker!! The audio port worked excellently with our mp3 player and kept us singing on the most arduous roads, that is a real bonus. Another bonus is I can now hear the stoker's stentorian breathing so I know she is working as hard as I am!!! All in all I have recommended the Tandem-Com to many other riders, I hope it will bring you some extra orders. I am totally infatuated with our set of Tandem-Com headsets and unit. It is lightweight, clear and has improved our communication and pace-line skills. From a Tandem-Talk owner needing more comfortable headsets, "After a first test they are much comfortable than the one I already own." Tandem intercom received 1st April, many thanks! I am amazed at how light it is and how comfy the headsets are! I am itching to try them out but as this is a pressie for the stoker's birthday it will have to wait a few days. The great thing is that we will be able to use them in our 1955 TR2 as it is very difficult to talk when traveling behind aero-screens, a real bonus! We rode for only a few months before we realized that we missed the spontaneous way we normally converse - and unfortunately sometimes interrupt each other (we're still working on that... ) So, we have been delighted with our purchase of a Tandem-Com. It's one of the better things that we have bought for our cycling. I take Marian to and from work on the tandem a few days a week which gives me about 75-80kms for the day. Marian gets fairly nervous in traffic and being able to chat quietly with one another whilst informing her of what's happening with the surrounding cars, obstacles, bumps, etc., is the best. Now that we are used to having the tandem-com we just wouldn't even contemplate riding without it. My daughter and I have found it difficult to carry on a conversation while riding until our first ride using the Tandem-Com! Our time together is now more meaningful as conversation is effortless. The headsets are surprisingly comfortable to the point we forget we have them on. Thank you for making a pleasurable activity even more enjoyable. It has added so much to our riding experience that we use it all the time. Thanks for your prompt service in getting it to me. Item received in 7 days, works well. We got our Tandem-Com intercom system in the mail last week and, after using it on a few rides, we had to tell you that we are delighted with it! Thanks for recommending that particular unit to us. It works great and has really added a new dimension to our tandem rides. And it certainly increases our safety factor by being able to talk back and forth like that. We're going to recommend it to the other tandem riders in our Desert Bicycle Club. By the way, your shipping was super fast and we appreciate that, too. Especially knowing how well it works! We bought our Tandem-Com earlier this year and what a great addition to riding a tandem. From the first ride, it's been wonderful to talk to one another in normal tones. As for battery life, I have no idea how long it will last... we've put many hours on ours and haven't change the battery yet. Since seeing our Tandem-Com, at least 2-3 other teams have purchased them... and love theirs as well. Our newest addition has been to plug in our i-pod to the auxiliary input... outside, riding together, ease of communication, our favorite tunes.... does it get any better???? having to do that - but it certainly adds to the tandem experience. in the group hearing every word. When we stand & climb, I call "and... sit"
breath to call it out louder. when I push the pace! I want to congratulate you, by the way, on a dramatic improvement over the Tandem Talker.! The more we ride, the more we like it. This has got to be the best piece of gear since we bought the tandem itself! !